Usually guac won’t last more than a day without browning. But this guacamole container creates an airtight seal that keeps oxygen out, so it stays green and fresh for days. (It’s great for hummus, salsa, and tzatziki, too.) Push the container’s base to remove the air and raise the guac to the top. 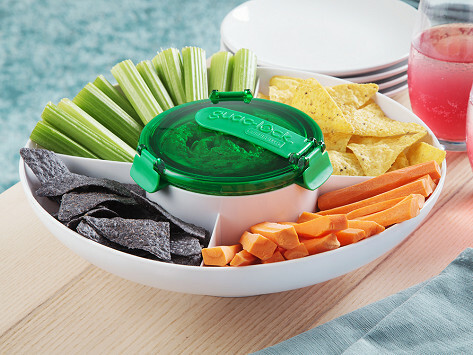 When you’re ready to serve, attach the tray and add chips or crudité. The push feature comes in handy as you start enjoying the dip—give a press and it lifts the contents to the top and avoids the need to scrape dip off the sides. Dimensions: Container: 4.5" x 6"; Tray: 12.5" diameter x 4.7"
I bought this for the guac keeper and it works well. Made Fresh guacamole and lasted for three days and was perfect. I love this, it’s perfect for entertaining. Lock that guac. 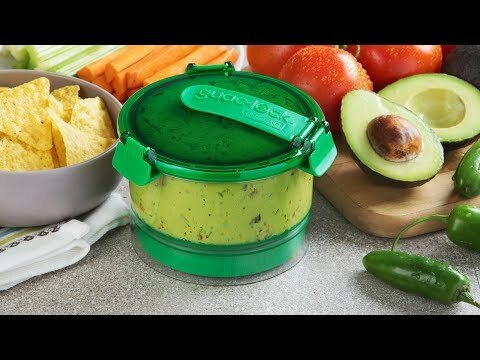 This shatter-proof, odor-proof guacamole container keeps it fresh, green, and ready-to-eat for longer. The container sits on a base that removes oxygen with a push (it reminds us of those push-up popsicles), creating an airtight seal. This keeps the avocados from turning brown, which means your guac stays green for days. And this oxygen-deprived environment can preserve other dips, too, like hummus, cocktail sauce, salsa fresca, and even tzatziki. When you’re ready to eat, Guac-Lock is great at serving, too. The push feature helps when you’re enjoying your dip. Give a gentle press down on the container’s sides to push the dip to the top, which looks more appealing and avoids having to scrape down the sides. We know how seriously people can get about their guacamole. Guac-Lock preserves it ‘til the last drop.